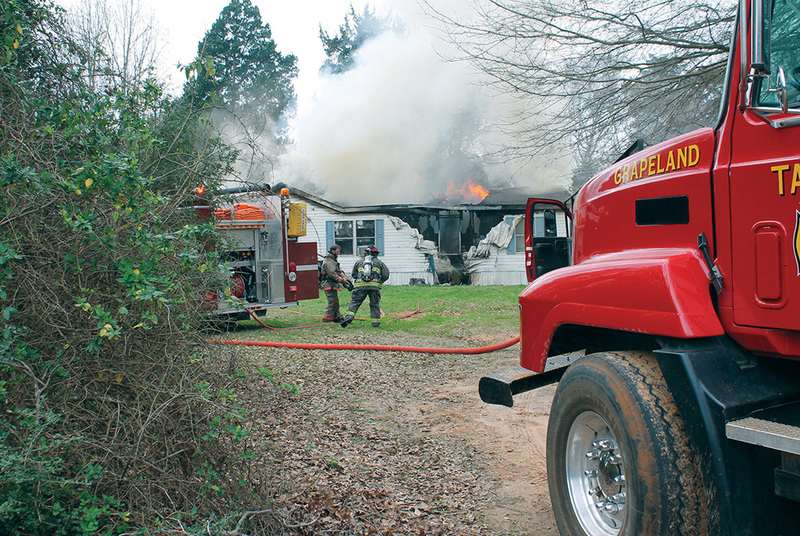 A house fire destroyed a home Wednesday afternoon near the Houston and Anderson County line. Photo by Sarah Naron/Messenger. GRAPELAND – A fire which occurred early on the afternoon of Wednesday, Feb. 28 at a residence located on CR 1895 near the Houston and Anderson County Line was determined to have been caused by a cigarette. “(The homeowner) was smoking in bed – and admitted so – and got the bedding on fire,” explained Grapeland Fire Chief Roger Dickey. Dickey explained that the woman – who neighbors said has limited mobility – was able to make her way onto the front porch. She was then assisted by the neighbors in getting further away from the house. Neighbors said at least three pets perished in the fire. The house, according to Dickey, was “a total loss. “There was heavy fire up in the attic, and before we could get it all extinguished, it pretty well burned most of the whole top off the house,” he said.